The deliciousness of a meat base… the richness of a garlicky herby tomato sauce and then pick your toppings of choice (that fit in with your macro’s ofcourse). P2 Recipe designed for HCG P2 Programme. Spread into a shape you love. Pull out of the oven. Bake for another 10 minutes on 190-200C. I am vlogging my Round 4 journey with a focus on health and wellness whilst doing this Round. 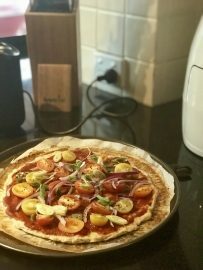 You can easily make this a Keto Recipe by using a high fat mince for the base and garnishing with chopped Avocado amongst other things… such a great recipe for pizza!